Learn the Truth About Pet Foods with Dr. Wysong’s book about pet food realities, myths and better feeding routines for dogs and cats. Tripawds offers savings on on Demain Dressler’s dog cancer nutrition supplement Apocaps at Amazon. 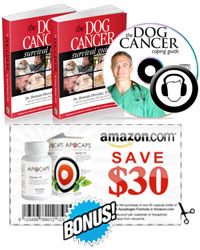 Save on Dr. Demian Dressler nutritional supplement Apocaps to help your dog fight cancer. Tripawds seeking feedback on Dr. Demian Dressler’s Apocaps nutritional supplement for cancer dogs. Help Your Dog Fight Cancer by Laurie Kaplan is a must-read for anyone faced with cancer in their dogs.